So this past weekend, while my daughter and five of her friends were tearing about the house in the midst of a sleepover, my wife and I relaxed in the back yard with some other parents, firepit roaring and beers in hand. Having recently been up to Vermont, I had two rarities in the Beer Fridge: Alchemist‘s Heady Topper and Lawson’s Finest Liquids‘ Sip of Sunshine. Both are hefty double/imperial India Pale Ales, chock full of hops, and both boast an 8% ABV in 16 oz. tallboy cans. In addition, both are considered among the finest double IPAs in the world, and number among the finest beers in the world, period. Having had both on hand, I decided to put them to the test, cracking open one of each and ruthlessly pitting them against each other…er…seeing how the differed and which I liked better. I did this quietly and on my own, of course, as the vast majority of folks — my wife and guests included — don’t geek out over beer like I do. Best not to frighten them. Both beers are excellent — let’s just get that right out of the way up front. If you were to find either one (highly unlikely outside the state of Vermont), you should purchase it post-haste. Both beers are potent in terms of both alcoholic content as well as the punch-in-the-mouth hop bitterness they boast. Now for the differences. Hops can have different scent and taste characteristics depending on the variety. Some skew citrus, others pine, still others floral. The brewers of these two beers chose to emphasize just one of those in each beer — which makes sense, because something this potent isn’t all that subtle. 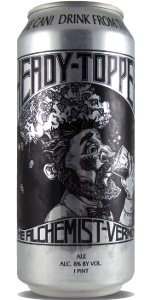 Heady Topper is a piney hop beer. Really tasty, really refreshing and a great palate cleanser for sweet or spicy foods. Oddly, you breath feels fresh after having a sip (Note: Actual freshness of breath unlikely.) It’s an excellent DIPA. Sip of Sunshine is slightly less hoppy, but very citrusy and almost juicy in flavor. It still packs a hop whallop, but does so with more balance. It definitely tastes like a sip of sunshine in beer form. The result? I’m going to give a slight edge to Sip of Sunshine, though your individual mileage may vary. Again, both are superlative, and you’d do well with either. Given a choice between the two, though, I’d grab the Lawson’s first.